Design a card for this art that is multiplayer friendly. If you need additional direction, make the card work differently depending on which multiplayer format it's played in (and relevant to more than one). Search your library for a card, reveal it, and put it on top of your library. Target player may have you put the card on the bottom of your library, if they do, draw 3 cards. Contrast: In any format without teams, you just reveal a big monster and get to draw 3 cards. In emperor or THG you have more control over what you get. It is tribute for instants and sorceries. This is a much worse Distant Memories. Also, for cost, compare to the unspectacular Diabolic Tutor, which your card is strictly worse than in multiple ways. Maybe push this to 1BB and add "and lose 3 life" to the card draw portion? I can't help but want to see this at B, just to see. Just to see. Can we nuke the massive color requirement and just put the tutored card into your hand if the other player doesn't want to let you draw? That makes it a slightly more expensive Library of Lat-Nam with a significantly better effect. I imagine this wouldn't see play outside of 2HG or Emperor as it is costed. I'm going to stray from the art for a similar design for Somnia. New Art: A lightning bolt illuminates the warped shadowy figure of a nightmarish nightmare. Search your library for a card, reveal that card to all players, and put that card into your library second from the top. Foreshadowing bolt deals 3 damage to target creature or player and an additional 3 damage to an additional target creature or player for each player you revealed that card to. "Even the outline of a nightmare is enough to scare somebody half to death." Search your library for a card with converted mana cost 6 or greater, reveal it, and put it into your hand. Each opponent loses 6 life. Or if you wanted to keep the "revealing" to different players part interesting you could change it to guessing and any player who guessed wrong would take damage. Starting with you, each player may put a 4/4 red Dragon creature token with flying onto the battlefield. Then, each player that didn't draws X cards, where X is the number of Dragon creatures on the battlefield. I think that, as the person spending a card on this, you should at least get to choose last. Yeah, that's probably a good call. - Put a 4/4 red Dragon creature token with flying onto the battlefield. - You draw X cards, where X is the number of Dragon creatures on the battlefield. Perhaps your dragon should be bigger? - Put an 8/8 red Dragon creature token with flying onto the battlefield. - Search your library for a Dragon card and put it onto the battlefield. I like the 4/4 vs 8/8 token version. The card draw option seems useless in a duel, marginal in 2HG, but serious in larger games. Whenever you would draw a card, instead you may have target opponent choose two nonland cards from your library. If you do, put those cards into your hand, then shuffle your library. For when you really need that wrath next turn to stop one guy wrecking the whole table. Whenever enchanted creature dies, its controller's opponents gain 2 life and draw two cards. Love it. Is draw two cards and gain two life ok on a monoblack card though? It's a tough sell as mono anything. Choose two target creatures controlled by different players. If those players are teammates, those creatures get +2/+2 until end of turn. Otherwise, those creatures fight each other. I think this would be more interesting if it let you choose whether to make them fight or get larger, particularly for formats like Star where you're not actually on a team with players you want to help anyway. It is also a mono-green card that red doesn't add anything to. Agreed on cutting red. Making the boost/fight completely optional adds enough flexibility the cost would have to be exorbitantly high. Is monogreen allowed to have two opposing creatures kill each other? Happens all the time in nature right? Young Hero untaps during each player’s untap step. T: Destroy target creature with power greater than Young Hero’s power, then put a +1/+1 counter on Young Hero. Any player may activate this ability as long as it is that player’s turn. In pure multiplayer, this is a highly political anti-fatty card that gives you a big creature when it's no longer useful to the table. In Emperor, it's a lopsided card that lets your side activate it twice to every one from your opponents, and leaves you with a large creature rapidly. Star magic is similar. 2HG this is bland and basically the same as in 1v1. I like that this has no evasion or innate defence against removal. Mechanically could be legendary, though I'll admit the art facing the back might work against that. Wizards shies away from tap abilities on "monger" style abilities. I'd recommend haste and a traveling controller (a la Korona, False God) if you feel tapping is integral to the design. That would have the unwanted side effect of needing R somewhere on the card. Sweet art! Weird template incoming! Choose a creature attacking one of your opponents. Put a 5/5 red dragon token with flying into play under that player's control blocking that creature. I'm a big fan of this type of card, and this card specifically. Seeing this printed in a set would make me happy. The one thing I would consider is changing "one of your opponents" to "another player". It becomes a stronger card in (2HG? Emperor? ), but that might be an upside. I don't want to give your teammate a 2 mana 5/5 flier, though I think a version that wast costed appropriately could say "attacking you or your teammate" and be awesome. Sweet card . Could be simplified to "another target player puts a 5/5 red dragon creature token with flying onto the battlefield." Or "target opponent puts a blah"
The blocking text and creature targeting are both really cool, but neither needs to be there. "It blocks this turn if able." would suffice and doesn't interfere with unblockable or protection from red. I agree "Target opponent puts a 5/5 dragon token with flying onto the battlefield." is much much simpler without losing much of value, and has the additional upside that it is mono-Red. Target opponent puts a 5/5 re dragon token with flying onto the battlefield. I love this one. It looks so Spikey at first glance then you read it more carefully and even ignoring all the multiplayer applications I'm sure Johnny will love trying to figure out how to break it. Target creature gets +3/+0 until end of turn. It fights target creature controlled by a different player. Possibly uncommon. Multiplayer products are usually preconstructed (Planechase, Commander, etc.) and rarity there is a bit muddled. This is basically the same as "Destroy two target creatures with different controllers," which would also be a neat effect. Multiplayer stuff aside, I think the +3/+0 could be roughly equivalent to the permanent +1/+1 counter from hunt the weak. 3R seems fair in a duel. Adding in the chance to make two opponents lose creatures of your choice, 3R seems low, but I'd start there and playtest. No, it's not the same as "destroy two target creatures with different controllers," because it allows you to potentially choose who wins the fight. You can also use it to pump an attacker. It's pretty versatile. There is certainly some added flexibility, but I think it isn't much. If you're using it to pump an attacker, you have to use it on one of your creatures which isn't optimal. Also, to clarify, my comment wasn't in any way a complaint, merely an observation that I think that is how it will play out most of the time. In a duel, it is a Bone Splinters and in a multiplayer game it is a (slightly restricted) Ashes to Ashes. Of course, it is Red, not Black, so it comes with traditional Red weaknesses like softness to creatures with really high toughness. CARDNAME deals 5 damage to target player. At the beginning of the end step, if that player has lost the game, you win the game. I'll render the cards this week. If there's a chance your opponent will concede, that means you can also use this as a bluff spell, right? That sounds pretty cool. Also strictly WAY better than Lava Axe. I'd say 4R at least. It balances your vindiction against the person who eliminates you with your desire for everyone to finish the game at the same time you lose so you can immediately play again, or at least go to food with people. Balancing real-life boredom against in game revenge is not a decision space I want to push designs into. Please add "or you lose the game". "Look, it's getting late. Something needs to happen. I gotta work in the morning." NAME costs 1 less to cast for each target beyond the first. Any number of target players choose a creature type. Destroy all creatures of a type chosen this way. This is quite a beating in Two-Headed Giant... and possibly elsewhere as well. Dedicated control decks can cast it for 5 mana even in two-player. I think I like it, though. The creature-type dimension gives it great flavor and interesting gameplay. Not that it's ever the 'correct' thing to do, but if I played this against a Changeling deck, I would SO get a kick of targeting just the opponent. As CARDNAME enters the battlefield, name a player. CARDNAME enters the battlefield with +1/+1 counters on it equal to that player's starting life total divided by 5. CARDNAME attacks the named player every turn if able. I love the flavor but we really don't see much beyond halving anymore. Pox was 1/3, and that was years ago. How married are you to 1/5? All starting life totals (that I know of) are multiples of 10, so I think 1/5 is justifiable in this situation. 1/2 would be way too much. I'm open to other possibilities, though. I totally agree with you (except in vanguard games). Point is: WE get it. We aren't the only demo that needs catered to. Target creature gains indestructible until end of turn. For each opponent, it fights the creature with the greatest power that player controls. Bleh that wording doesn't seems right. Help? Target creature [you control?] gains indestructible until end of turn. For each opponent, that creature fights the creature with the greatest power [among creatures] that player controls. The wording's fine, except that the rules don't work well with fighting multiple creatures at once (what order do you fight them in?). Since you're granting indestructible anyway, why not just deal damage equal to the target creature's power to each of the others? Also, did you want to say "target creature you control"? Or add "in turn order". I'm not 100% sure it would happen simultaneously. Does the "for each player" not resolve in turn order already? 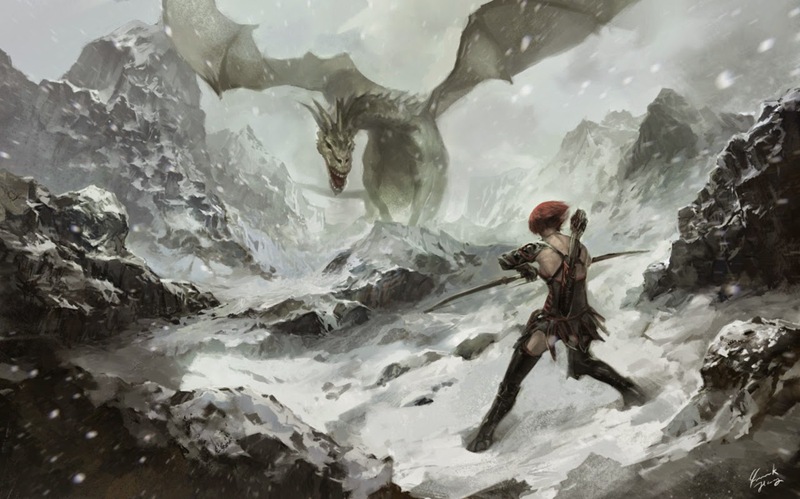 After years of training, she realized there’s one way to kill a dragon: shot first, and hit the bull’s eye with the one shot. I went for a design I did some time ago, that grows in power the more opponents you can attack (Rattlesnake effect). This design can be done in many colors. It has to be necessarily green (for reach), but can have white or red for first strike, and can add black for deathtouch. So we have: BRG, RG, WG, WBG. I feel for such a defensive card white makes more sense than red, and that black can be omitted. I'd like to know your thoughts about it. Regarding the rarity, it originally was an uncommon 1/3 at the same price, but I bumped it to rare, thinking it would be miserable to play against in multiples in limited. Props for this elegant solution! It feels like its a half a point away from owning this challenge. Vigilance would go a long way towards making this a multiplayer all star. Scary attacker and a rattlesnake. How does this grow in power the more opponents you have? It only has combat-relevant abilities and can't protect itself. Does the option to play politics really outweigh having more life totals to chew through/having more potential sources of kill spells aimed at it? Maybe "grows in power" isn't exactly correct as sentence. It has an important function in multiplayer: it deviates attacks from you and to other players (the so called rattlesnake effect, by Antony Alongi if I recall correctly). The same reason why Spectral Prison/Propaganda are way better in mp than duels, or that Edric Spymaster of Trest, while not a very strong card in duels, becomes a powerhouse in multiplayer, ecc. These type of cards do not scale in power with more opponents (à la Gray Merchant of Asphodel, Syphon Life, Primordial cycle, etc.) but they nonetheless are more powerful than in duel. In a duel, I'll kill your Dragonslayer Sniper and then attack you, but if I can attack other opponents without having to battle a Deathtouch first striker, why would I attack you anyway, or bother wasting a pin point removal against a 2/3? Do note that you say "having more life totals to chew", but (big) part of this card power is exactly to let/make your opponents do that very work for you: chew each other's life total while you remain in a safer position. Nitpick: Edric is actually very strong in 1v1 and not all that great in multiplayer. It's banned in duel commander and has even placed highly in a few Legacy tournaments. You have to ask "how is this card benefiting me more than it benefits my opponents?" Edric fails that test pretty miserably because letting your opponents draw cards in exchange for lowering opponents' life totals isn't a very good tradeoff (cards > life) whereas in 1v1, you have zero opponents who can take advantage of the card draw effect better than you can. In FFA, sure, a first strike deathtouch dude is going to convince opponents to go after someone else, but that's assuming 1) you're not the obvious threat that people want to be pointing all their disruption at anyway, and 2) you can do something useful with the time you're buying from not being attacked; if the other players are Sim City-ing it up toward some combo engine or board lockdown, your investment in a combat stats dude is going to look pretty silly by comparison. I'd guess this is probably most optimal at an FFA table with 3-4 people, worse with 5+ but still better than in duels, and doesn't benefit you in formats with modified attacking rules, like Star, Emperor, 2HG, and Attack Left/Right. Destroy target creature with power 4 or greater. If it was a dragon, draw cards equal to its power. Since big creatures are so much more common in multiplayer games. Choose an order for each player. CARDNAME deals one damage to the first player, two damage to the second, and so on. Whenever a source you control would deal damage to enchanted player, it instead deals double that much damage. Whenever a source that player controls would damage to you, it instead deals double that much damage. Whenever another source would deal damage to either player, it instead deals half that much damage, rounded down. Unfortunately the card is really wordy for what is a simple concept. The idea is that in a game like Emperor or Star, this is a really powerful fight variant, as you will always be fighting someone a few players away, but in games like 2-Headed Giant or Chaos, it limits who you can fight. not necessarily, there was that powerstone thing in planes chase that interacted with the planar dice, you would just have to add an extra effect to this spell that would not make it a blank card in a 1v1 duel. Reminds me of the game "Bang!" where distance between players matters a lot. An easy way to make this 2-player-relevant: Just say "fights another target creature." Then it's a 2-mana Prey Upon when you use it against your neighbor / duel opponent, and +X/+X still provides plenty of incentive to go after players sitting further away. Originally, it could fight any creature as Ipaulsen suggested, but I didn't care for the "all-upside" version. I liked that the more specific one was good in some multiplayer games but not good in other multiplayer games. It also isn't silver-bordered, since cards like Mystic Barrier, Order of Succession, and Grenzo's Rebuttal directly reference seating arrangements. But they all work in duels. Admittedly Mystic Barrier doesn't do much, but at least you can cast it. Put X 1/1 green archer creature token with reach and deathtouch onto the battlefield under your control, where X is equal to the number of your opponents. Other players attack enchanted player with at least one creature if able during each combat. This is very clever, though I think it should cost at least 2R. Each player names a card. 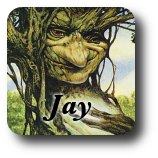 Whenever a player destroys a creature with a chosen name, that player may reveal that name and draw a card. @: Destroy all non-named creatures. Whenever a player destroys a creature with a chosen name, that player may draw a card.